"This whole year has been very bittersweet," says Cynthia Zamperini Garris, whose much-loved father Louis (Louie) Zamperini passed away last July at the age of 97. "Losing my dad was heartbreaking -- it's still hard to say goodbye -- but there has also been all the celebration of his life, especially with the film and the Rose Parade." The movie that Garris is referring to is Unbroken, a feature film directed by Angelina Jolie. Released in December of 2014, Unbroken is a true-to-life drama that recounts Zamperini's rapscallion youth, his ascent as a track star and Olympic athlete, the 47 harrowing days he spent floating in a raft in the Pacific Ocean following a WWII plane crash, and the torments he faced in a Japanese prison camp. Unbroken -- as its title suggests -- is ultimately a story of resilience, transcendence and forgiveness. Regarding the Rose Parade, Louis Zamperini was its 2015 Grand Marshall in Absentia, honored as a profoundly heroic and inspiring figure. Zamperini's long, varied and eventful life has also been the subject of two books. In 2003 he published his own book -- Devil at My Heels: A Heroic Olympian's Astonishing Story of Survival as a Japanese POW in World War II -- which was followed in 2010 by Laura Hillenbrand's Unbroken: A World War II Story of Survival, Resilience, and Redemption, the basis of the recent film. "From the day I first spoke to him," says author Laura Hilenbrand of Zamperini, "his almost incomprehensibly dramatic life was my obsession." Hillenbrand's detailed and vivid book, which stayed on the New York Times bestseller list for over four years, and the paperback edition retains a five star Amazon rating after over 18,000 customer reviews. In the Fall of 2013 Jon Swihart, a scrupulous and preternaturally patient artist who lives and works in Santa Monica, was commissioned to create an oil portrait of Zamperini. Part of what made the commission especially meaningful for Swihart was that he had been offered the chance to paint Zamperini six months earlier, but that first opportunity had fizzled. 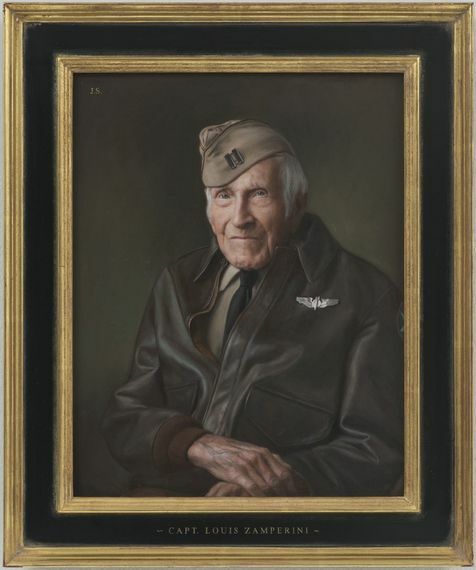 "It was hugely disappointing to me when the first commission fell through," Swihart recalls, "as I had read Unbroken and already envisioned how I wanted to paint Louie dressed in his old WWII bomber jacket and officer's cap. Then out of the blue, fate gave me a second chance to paint him." Jon Swihart Swihart's second commission came from Angelina Jolie's husband, actor Brad Pitt, who planned to present the finished painting to his wife as a present. It was meant as a gift of love and also a talismanic image of the hero at the center of Jolie's film. Pitt had seen and admired Swihart's portrait of artist Don Bachardy, and that had given him some idea of what Swihart was capable of. As a result, Swihart was offered the opportunity to paint Zamperini as he saw fit: "Brad gave me complete artistic freedom," the artist notes. What Swihart hoped to do was create a single small painting that would transmit some of the qualities that Angelina Jolie's movie had dramatized in 137 minutes and that Hillebrand's book had taken over 500 pages to illuminate and distill. It was a challenge that Swihart took to heart: "I put everything I had into this," he states. Cynthia mentioned when I first spoke to her that there was a certain look he occasionally got in his eyes, a masculine, transcendent but determined look that really personified Louie and no photographer had ever captured. Cynthia agreed to work closely with me to try to elicit that expression when I first met and photographed Louie. Conveying that look in Louie's eyes became essential. After carefully scrutinizing the photos that he took that day Swihart selected a single photo that he captured just the right "look" in Zamperini's eyes. Working on her own, Cynthia Garris chose the same photo. "There was this openness in his face," says Garris, "and determination in his eyes." Jon Swihart says of Zamperini: "He reminded me of the evangelist Billy Graham, who I had painted years earlier. They both exuded a quiet, peaceful strength and charisma. I found out later they were friends." As he prepared to paint Swihart decided that the portrait would resemble -- in both mood and technique -- a Flemish devotional icon of the early Renaissance. It would measure just twelve inches high by nine inches wide. "I like small, quiet work," Swihart philosophizes. "It draws you in and creates a world that holds you. You also have to be very quiet to connect with small work." When the painting process began, Swihart experienced the panel as being perhaps even too small. "How am I going to enter this world?" he remembers asking himself. With time the image began to take shape, the panel magically began to appear a bit larger as Swihart spent countless hours becoming sensitized to its dimensions. As it developed the portrait that was appearing didn't seem quite right. After about two weeks of work Swihart woke up one morning and realized that he needed to start over. The second attempt went better, and Swihart was able to methodically conceive and modulate the important aspects of the portrait. Zamperini's face was resolved quickly --"I got it right off the bat," Swihart recalls -- and the piercing blue of his subject's eyes remained the brightest note of color in a composition that would remain muted and sober, emphasizing umber, tan and grey tones. 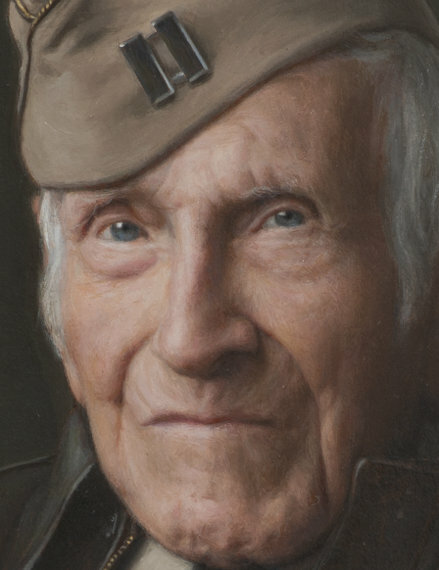 Captain Louis Zamperini (detail) Although Swihart works from photographic references, he takes considerable liberties with his images as they develop. 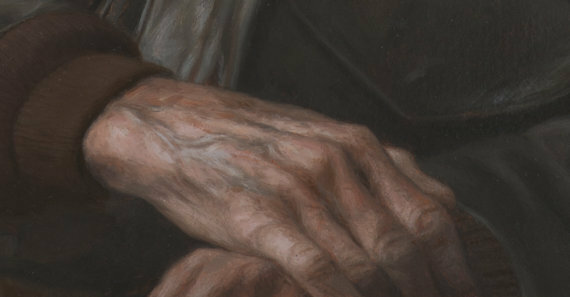 In the case of the Zamperini portrait, there were things that the artist wanted to allude to in subtle ways. For example, the flight jacket was re-shaped to suggest a kind of Baroque dynamism: "His jacket folds became metaphors for the twists in his life," Swihart explains. "In the lower area the folds are active and writhing, but around Louie's face they open to release and frame his features." 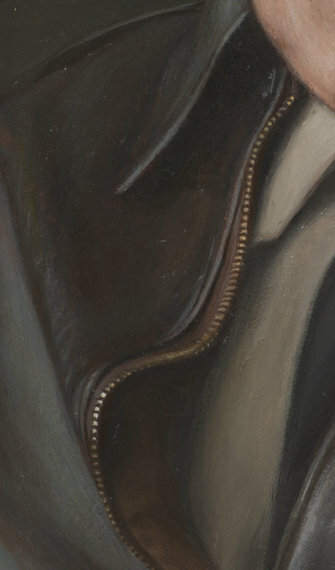 Captain Louis Zamperini (detail) The teeth of the jacket's zipper, which glisten and move upwards in a sinuous curve, represented a special test of Swihart's patience, but he found that by building up his powers of concentration through weeks of painting he was able to manage them. "By that point I was so locked into the painting," he says, "I was thinking about it during every waking moment." 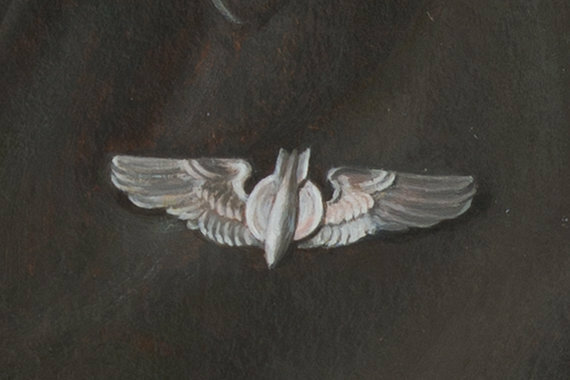 The most difficult detail of the painting, surprisingly, turned out to be the bomber wings, which measure just over an inch across. "I ended up repainting them several times to suggest an upward movement and flittering effect," Swihart reports. Captain Louis Zamperini (detail) Completely absorbed in his project it took Jon Swihart six weeks to complete the painting. 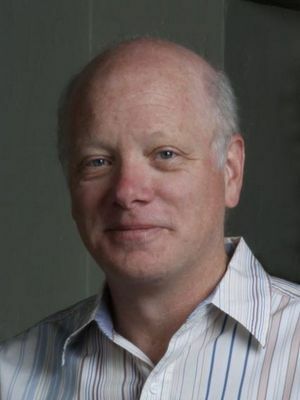 "This is one of the most gratifying commissions I have ever had," says Jon Swihart. "The story of Louie's life is such a huge story, and I felt that I had to get it right. I was motivated by my desire to honor Louie." I believe a good portrait is absolute magic and conveying someone's essence in paint is an intuitive blend of fidelity to reality and poetic license. I've been painting close to forty-five years and it still puzzles me that, what is essentially colored earth smeared on wood, can be permanently imbued with the ephemeral quality of someone's presence! A great portrait, even of someone unknown to the viewer, needs no explanation to be understood and appreciated, because it is a communication that transcends words. Captain Louis Zamperini (detail) Swihart was able to show Louie Zamperini the completed painting before it was presented to Angelina Jolie. As Swihart explains, he was genuinely very pleased with his portrait and said, "It's very good, thank you!" Angelina Jolie, who received the portrait as a gift in December of 2013, was equally happy and deeply moved. She took the painting with her when she traveled to Australia to complete the filming of Unbroken, and now keeps the painting in her private office. "Angie treasures the painting," says Cynthia Garris. "It was a wonderful and very romantic gift." Zamperini was given a framed photo of the portrait for his 97th birthday, and around that time he and Jon were able to visit. "He was a great storyteller," says Swihart. "It was an honor to visit and spend time with this man who had an amazing memory and ask him specific details about his extraordinary life. He was kind, giving, sharp and had a great sense of humor." During their final visit, Jon had an iPhone photo taken with Louie Zamperini, that later disappeared when his home computer crashed. "I wish I still had that photo," Swihart sighs, "but I will always have great memories of Louie Zamperini. He had a strong, quiet presence." With his considerable patience -- and egoless skill -- Jon Swihart managed to immortalize that presence perfectly.